The Android versus iOS platform war is heating up. Just one day after Apple announced its new in-app subscription model, Google responded with a similar scheme. Google may soon launch its long-expected music service to compete with iTunes, and Apple may be trying to horn in on mobile social products such as Google Buzz with a revamped Mobile Me. The two companies are competing so closely in the mobile arena that it's hard to tell them apart at times. So who's got what and which platform offers the most goodies for the average smartphone lover? Here's a breakdown of some of the major features in the iOS and Android universes. In a classic case of "mine's bigger," Apple, Google and the press spend a lot of time talking about how many apps the two stores have. The truth is that each store reached its critical mass a long time ago that ensures it has the third-party apps people want such as Dropbox, Evernote, Angry Birds and Amazon Kindle. There are some gaps, such as Android's lack of a Netflix streaming app, but for the most part each store has its fair share of apps. But in case you were wondering, iTunes has more than 350,000 iPhone apps plus a few thousand more specifically for the iPad. Android had more than 100,000 apps at last count in late 2010, that number has likely gone up dramatically since then. A recent study by security firm Lookout found the Android market was growing at a rate three times faster than the iTunes App Store. Apple's U.S. iTunes music store has more than 13 million songs and is the dominant player in the U.S. digital music business owning about 70 percent of the market. Google hasn't got into the music game yet, but the search giant has been talking about a cloud-based music service for Android for close to a year. At Mobile World Congress in Barcelona, Sanjay Jha, CEO of Motorola Mobility, said Google's music service would be launching soon, according to the Guardian. Google and Motorola have a close working relationship on Android products such as the first Honeycomb-based tablet the Motorola Xoom. As for video, Apple again has a wide selection of movies and TV shows on iTunes, while Android relies on third-party services such as Blockbuster. Hardware is easily the biggest differentiator for the two platforms. Apple currently sells just two smartphone models--the iPhone 4 and iPhone 3GS--available on two different carriers in the U.S. There are different storage configurations you can get, but there are only two different base models. Apple also sells the iPod Touch and the iPad. Android has nearly 40 Android phones available for sale in the U.S. at all four major U.S. carriers. So far the only significant iPad-like Android devices have been the Samsung Galaxy Tab and Dell Streak 7, but the Motorola Xoom and HTC Flyer are coming soon as well as devices from LG, Toshiba, a new Galaxy Tab and many others. Both companies are using their mobile platforms to enter the highly contested set-top box market facing off against competitors such as Microsoft, TiVo and Roku. Google TV is an ambitious project that combines television, online video and the Web into one platform for set-top boxes and Internet-connected HDTVs. But Google TV has seen resistance from major television networks unhappy with Google's multimedia mash-up. The iOS-based Apple TV is a more humble offering than Google TV that includes Netflix, iTunes and PC-to-Apple TV streaming via AirPlay. 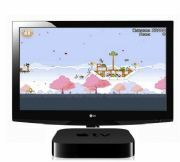 Google plans on opening up Google TV to third-party apps, and Apple is expected to do the same for Apple TV. Each platform is touting the wonders of HTML 5 and the highly functional Web apps the new standard brings. But iOS and Android differ on how to deal with Adobe Flash video--the most popular format for Web video. Apple refuses to allow Flash functionality to be built into iOS, and is pushing for Web sites to adopt iOS-friendly H.264 video with an mp4 wrapper. 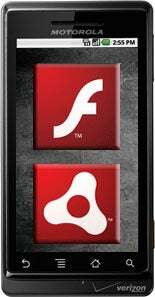 Android, meanwhile, supports Adobe Flash 10.1 in Android 2.2 or greater. But Android's Flash advantage is becoming less of an issue. A recent report by video encoding service Encoding.com said that 78 percent of its customers are now encoding mobile video in iOS-compatible formats. There are tons of miscellaneous goodies offered on the two platforms. Google's Android, for example, offers extensive voice commands for sending text messages, e-mail, placing phone calls, Web browsing, opening apps and search. The iPhone's native voice commands include music playback controls and voice-activated dialing; however, you can use Google's iOS app for voice-based search. Both platforms recently unveiled in-app subscription plans allowing you to subscribe to your favorite news sources, music and video services or other subscription-based content providers. Android also offers free turn-by-turn directions in Google Maps for Android; while Apple relies on third-party services such as Waze and MapQuest. Each company is also trying to get into social in a big way, although neither has adoption rates close to social media's big players such as Facebook and Foursquare. Google has Google Buzz for information sharing, Orkut for a Facebook-like experience and a third social push, the oft-rumored Google Me. Apple has Ping, a music-based social network built into iOS and desktop versions of iTunes. The company may also be overhauling MobileMe to include location-based and media-sharing features, according to recent rumors. There's a lot to love about both platforms, but feature for feature it's often hard to distinguish which platform is superior, especially when you factor in third-party apps. Connect with Ian Paul ( @ianpaul ) and Today@PCWorld on Twitter for the latest tech news and analysis.